July 8, 2010 Students participating in the Age of Awareness Summer Program at G. James Gholson Middle School in Landover, MD, became rocket scientists today as they designed, built, and tested their very own Water Rockets! 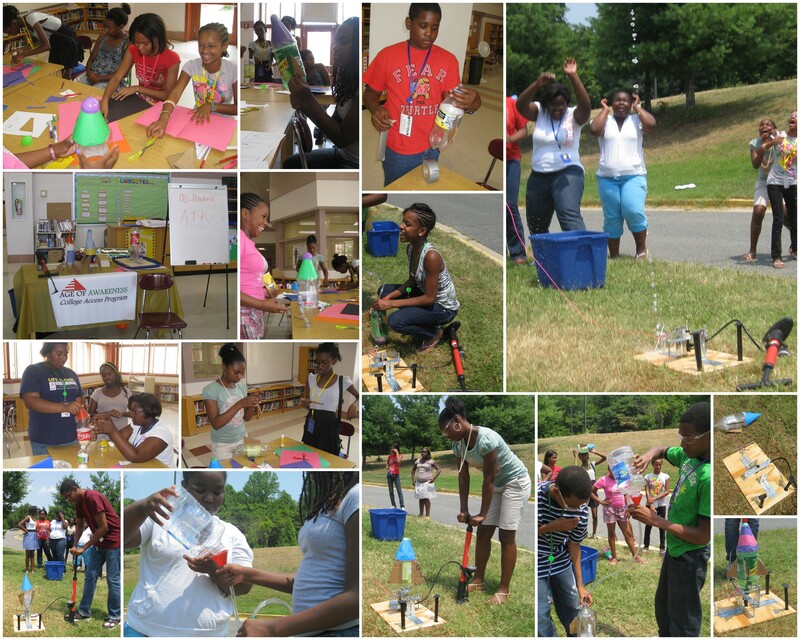 Led by Andrea Kodys, an aerospace engineer at ATK in Baltimore, the students learned about the engineering design process and discussed the skills and knowledge that they will need for engineering and science careers while creating nosecones and fins to turned ordinary soda bottles into rockets. The highlight of the activity was the testing phase as the teams of students headed outside to launch their rockets. Each team loaded their rocket with propellant (water), pressurized the chamber using a bicycle pump, and counted down the launch. On this hot summer day, the spray of water from the rockets as they headed skyward was a very welcome reward for a job well done!